Today, in interiors it’s all about wallpaper. The selection and choices are more varied than ever before. From bespoke wallpaper that can be made from your very own photos, to wallpapers from some of your favorite designers like Sophie Conran, wallpaper is definitely back in style. Here are some inspiring looks sure to make a statement at home. 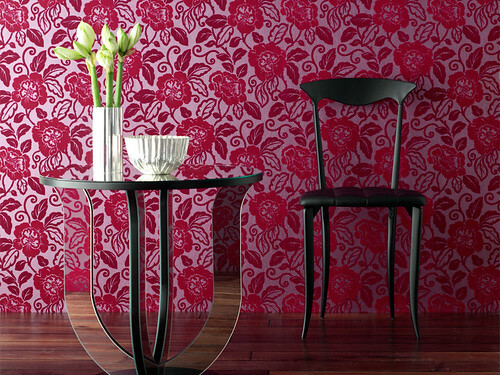 This Venezia classic wallpaper would look incredible on a feature wall. A little goes a long way. This Geisha design is a busy pattern that’s toned down in a refined color palette. Could you imagine this in your bedroom? I love how the flowers in this Exuberance Floral wallpaper look like they’ve been sketched on to the wall. Big, exotic blossoms feel so modern. If you’re ready to cover up those blank walls, UK site My Deco has exclusive wallpaper for 40% off! Explore more inspiring wallpaper ideas right here. The the pink/black/white wallpaper. Amazing! I'm not a fan of wallpaper, but the prints are lovely. Down Comforter, I think that's my favorite too. Lenox Ave, really? What don't you like about it? I hate the idea of having to paste it up, and it's impossible if you live in an apartment. But, I've always had the idea of framing some pretty papers to create a feature wall. oh fun papers….great site too…never heard of it till now. Thanks so much for visiting Samantha! I like all of them! Especially the last one. Classic and elegant. Gonna try it at home soon! Jenna Lyons in Living Etc.! Have An Artsy Weekend!